Taste Bar + Kitchen, located in Midtown at 3015 Bagby, offers globally inspired comfort foods & craft cocktails in an energetic, casual dining environment. The concept was inspired by Chef Don Bowie and entrepreneur Kevin Kelley and their international travels, resulting in the fusion of ethnic flavors with a menu of southern staples. 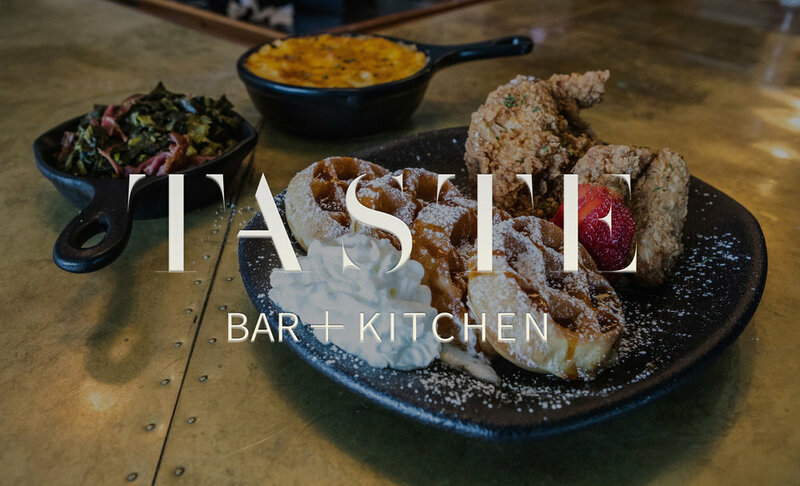 Guests to Taste Bar + Kitchen can expect comfort foods featuring an extensive chicken & waffles menu. Savory & innovative waffle highlights include Cajun Chicken & Waffles, Chicken Fried Lobster & Waffles and General Tso’s Chicken & Waffles. Diners with traditional waffle preferences will enjoy the selection of sweet waffles including Spiced Butter Pecan, Red Velvet and Banana Nut. Other noteworthy menu items include jerk lamb chops, an elevated selection of mac and cheese and fried chicken & champagne. Along with comfort classics, Taste Bar + Kitchen has developed a craft cocktail selection known as the Dessert Bar. The menu provides a boozy spin on dessert favorites with highlights including Vodka Peach Cobbler, Bourbon Pecan Pie and theVodka Cotton Candy Cocktail. Guests can also enjoy specialty champagne mimosa mixes. Taste Bar + Kitchen offers valet parking, DJ entertainment and flat screen televisions making it the perfect destination for your next gathering! Shaken and served up. Laird’s apple brandy, spiced apple butter, lime, egg yolk, garnished with crust crumble and grated cinnamon and nutmeg. Bourbon, orgeat syrup, lemon, whole egg, black walnut bitters. Shaken hard and served up in a wine glass. Garnished with candied pecans. Rosé Vodka, pink cotton candy, fresh strawberry, lime juice. Deep Eddy Vodka, Pinnacle Whip Cream Vodka, peach cobbler puree, lemon juice, turbinado syrup. Shaken and served in a rocks glass with crushed ice and garnished with whip cream, graham cracker crumbs + mint. Cocoa nib infused bourbon, Cointreau, angostura, Aztec chocolate, and sparkling wine. Stirred and served in a flute topped with bubbles and garnished with a magic shell. Zephyr gin, sparkling rosé, rosemary syrup, lemon juice + simple syrup. Cachaca, muddled lime with granulated demerara sugar, ginger syrup. Served in a rocks glass with crushed ice and garnished with candied ginger. Blanco tequila, jerk syrup, jalapeño Serrano tincture, lime and grapefruit juice, and Topo Chico. Shaken and served in a tall Collins glass over cubes. Rimmed with a house spiced salt and garnished with a grapefruit triangle. House Pina Colada With an Herbaceous twist; Don Q White Rum, Don Q Coconut Rum, Yellow Chartreuse, Housemade Coconut Milk Syrup, Lime, and Tiki Bitters. Ground beef with gouda and cheddar cheese cooked inside a delicious buttermilk waffle. Diced ham, shredded hash browns, and cheddar cheese cooked inside a delicious buttermilk waffle topped with green onions and sour cream. Jerk and herb marinated lamb chops. Chicken smothered in rich brown gravy and waffles. Spiced rubbed friend chicken + waffles. Call 832.487.9958 from 5a – 11p daily, or book online with OpenTable. For reservations, all guests must be present for party seating. Fri: 5 P.M. - 2 A.M. Sat: 11 A.M. - 2 A.M.
Street Parking My Be Found on Rancier and surrounding streets.